Amusement park food can be a highlight of a family vacation, since so many destinations pride themselves on both their traditional and diverse treat options. Below are some of the best theme park eats around, and where you can find them! Many of us have childhood memories of eating cotton candy after a ride on the carousel, or stealing a bite of a sibling's ice cream cone at the Boardwalk. It's true that over the years, amusement parks have provided snacks and sweets synonymous with our young and carefree days. 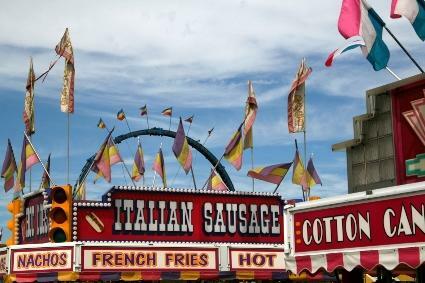 Our children are now possibly enjoying these same indulgences, as parents relish in the opportunity to once again experience a funnel cake or finish off a bag of saltwater taffy guilt-free. However, today's amusement parks are not only expanding the range of options available to guests, they are upping the quality and trade marking specific goods like never before. From old time seashore attractions to the latest and greatest from the Disney Company, amusement park food has become even more memorable than in days gone past. While French fries still hold the number one spot in most people's hearts, there is a new potato item on the block that has made a name for itself in theme parks. The potato salad found at DelGrosso Amusement Park in Pennsylvania, is a popular choice for countless guests. Made fresh each and every morning, people love the comforting combination of homemade goodness and wholesome flavoring. The Enchanted Tiki Room is a classic destination inside of Disneyland in southern California. As a crowd forms in the waiting area for this attraction, check out the Dole pineapple cart just inside. Besides their popular pineapple soft serve, they also offer a float version with pineapple juice. Remarkably refreshing, especially during the hot summer months, this is one treat you don't want to miss. Hot dogs may seem like typical amusement park fare, but you may think differently after you taste a Nathan's hot dog at Six Flags Great Adventure in New Jersey. These famous New York franks are finding their way inside of theme parks, and the results couldn't be tastier. While there are plenty of stands and stops along the route of a typical amusement park day, fine dining restaurants are meeting great success in parks as well. Some have an ethnic flair, and some offer gourmet versions of classic favorites. Whatever you feel like eating, chances are today's amusement park menus can provide it. If you find yourself in Disney World, chances are you will pay a visit to Epcot's World Showcase, featuring some of the best international cuisine in theme park history. Les Chefs de France is one of Epcot's fine dining hotspots, currently managed by the top three restaurants of France. The menu is as authentically French as one you will find in the United States, and like every destination in Epcot, the staff is all native to the country in which the cuisine represents. Try the Lasagnes de legumes du soleil a l'huile d'olive au thym - in other words, the vegetable lasagna with zucchini, tomato, bell peppers, onion and eggplant. A Disney favorite on the other coast, the Blue Bayou restaurant has long been an upper class tradition at this magical little park. Located inside of the Pirates of the Caribbean ride, you can watch boats drift through an artificial cove, as you select an impressive menu that changes seasonally. Be sure to order a sugar pirate ship for dessert, as its culinary architecture alone will wow you. At Busch Gardens Africa in Tampa Bay, the Crown Colony restaurant is where people go for an impressive array of seafood, steaks and gourmet sandwiches. When you need a full service break from walking around all day, try their succulent chicken fettuccini as you enjoy a gorgeous view of the park's Serengeti Plain. Amusement park food doesn't always have to be expensive or unhealthy. Many theme parks have reacted to customers' demands for more nutritious options, and you will find a variety of choices at many quick stop eateries within the parks. From vegetable skewers to bountiful fruit cups, you will find plenty of foods that will satisfy your stomach without expanding it.